The Serval is a medium sized feline that is often mistaken for the Cheetah due to the coloring. It has a tan body with a variety of spots all over it. However, a Serval has a smaller neck and smaller head. It also has ears that are tall and triangular as well as close together. They range in size from 15 to 40 pounds with males being larger than the females. 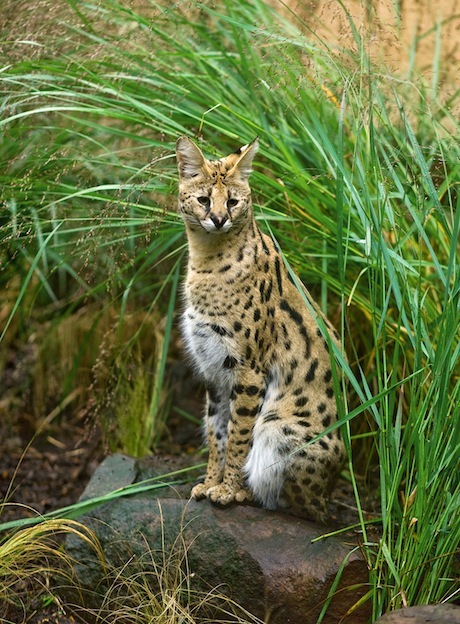 You will notice that the Serval has a large tail, compared to other cats such as bobcats. They body is very slender but it is also quite strong. Their body design makes it possible for them to climb very quickly. They can also swim well. They have very long legs that allow them to jump with ease. Africa is home to the Serval and they live all over the Savannas. Some of them are known to live in the mountain regions though. They do need water frequently though so they will only be living in areas where they can get access to it. Careful observations of the Serval prove it to be a very intelligent animal. They have problem solving abilities. They are very curious and crafty species. They are able to escape from predators though due to their thinking skills and rapid movements. They are known to be very territorial and the males will fight extensively over it. They will move into new territories if they have the opportunity to get better access to food. In many instances though they are being forced out of their habitat due to human efforts. The Serval is an excellent hunter so it typically has no trouble at all getting food. The main staples of its diet are hares and rodents. However, there are many other foods it will consume if the opportunity presents itself. They include birds, reptiles, insects, fish, and rarely carrion. Occasionally they have been identified as taking down larger animals including Deer and Gazelle. Mating may occur for the Serval during any time of year, however during spring it is more likely to happen. Once mating is successful the young will arrive from 65 to 77 days later. There are typically no more than three kittens per litter. They are born in a place with dense vegetation that the mother has found for them. It is common for her to simply take up residence in such areas that other animals have abandoned. The young have a high mortality rate in the wild due to other felines. Some predators do attempt to take down the adult Serval. However, they are often able to predict such movements and can escape. This includes the Leopard. In the wild the Serval may be able to live 12 years and 20 in captivity. The number of Serval remaining in the wild today is low. This is mainly due to humans invading the territory where these animals were once free to roam. The fact that it was once heavily hunted for its fur has also played a major role in the low numbers. There are some efforts in place to protect the habitat that they have left. There are efforts in place to stop the attempts to domesticate the Serval. Many people are interested in the variations of these felines. For example there is a genetic factor called melanism. This gives them a black color that resembles the Panther. There is also a variation that results in them being white with silver spots.